Live Creating Yourself. 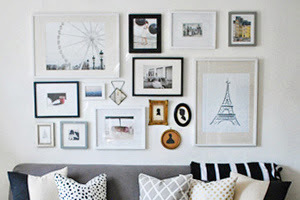 : Belle: Help me choose art for my living room! 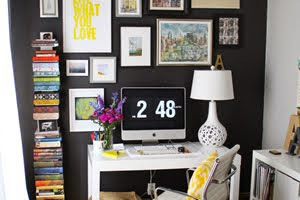 My home tour will be debuting next month on The Everygirl (you already saw most of my office! ), but there are just a few finishing touches I need to get done around the apartment. Notably: art. The biggest decision for me in this place was what to hang above my living room couch. It's the focal point of the room, and it was going above my new couch baby (the Carlisle English roll arm sofa from Pottery Barn - my first big furniture investment piece). I've been a longtime fan of Sharon Montrose's Animal Print Shop and was really excited at the thought of having two of her 17x22" photographs hanging there (they fit perfectly in my $25 Ikea frames)! Who doesn't love a good animated gif? The room is completely neutral, so do I stick with that or throw in a touch of pink w/ those fun flamingos? Which duo should I have as my new living room art? Vote in the comments! See the full decorating process of my apartment, Belle, here. Or catch sneak peeks on AlainaKaz Instagram! An ostrick and her egg! To be honest, I really like the art you already have up there, but if you have your heart set on the animals, the flamingos are far and away the best choice! They're fun and a nice punch of color in a neutral room. Baby zebra and tiger. Keep it neutral. I do agree with the above comment. I also like the art you have up. I am loving the pink tones of the flamingos! ostrich and egg! such a fun unexpected combo. I'm so glad I'm not alone on this one - I love the ostrich + egg. Flamingos! They're fun and bright! Love the two pink flamingos! I'm partial to the ostrich and the egg. 100% ostrich with the egg. It has so much unexpected character. I love the colors with your place too! I vote for the flamingos. You could use a pop of color to offset all the neutrals! For my daughter's 5th birthday a few weeks ago, I bought two of Sharon's prints and they are amazing. And so hard to choose. I love the pop of pink the flamingos give your space. you can't go wrong with any, but i love the flamingos for a pop of color! 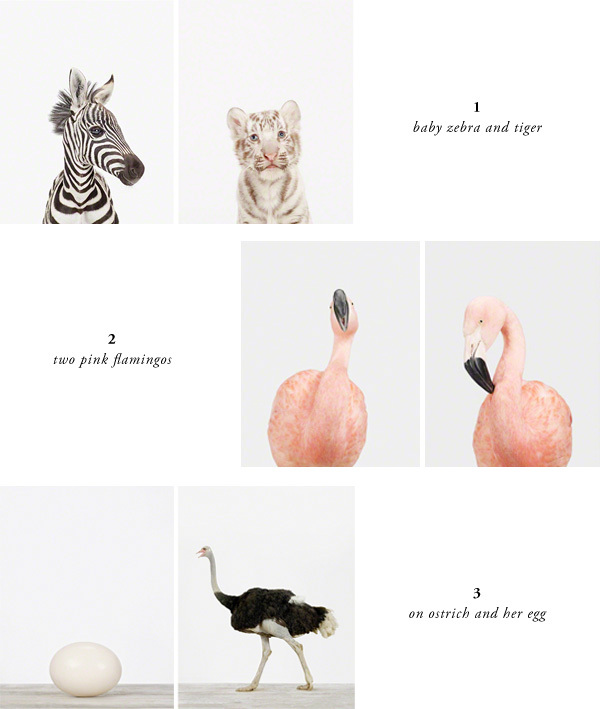 The ostrich and her egg is awesome, but I like the zebra and the pink flamingo together the best. I love the pop of pink with the black and white stripes, and their positioning makes them look like friends having a conversations. So random, but cool to pair them up together. I really like the zebra and pink flamingo together too! I'm glad to see I wasn't the only one!! Loving the color with the flamingos! The two pink flamingos add a nice pop of color to your otherwise neutral space. Love those! The flamingos. I think the pop of color will definitely help the space. Though I must agree with some of the other comments, the art you already have is very nice as well. The flamingos for sure! They're a great pop of color, without being an obvious "I'm looking for a pop of color" piece...if that makes any sense. Flamingos all the way. A bit of color and the prints are so beautiful! I like the zebra and the baby tiger! this post makes me giggle. i like the ostrich and her egg. How cool is this post?! I vote flamingos, definitely. Honestly, I love them all. But there's something adorable about the ostrich and egg. I keep saying I'm going to get one of her prints, but I can't choose! Animated GIF was a great idea. Flamingos for the win. I think it will be most relatable for your audience and the warm pink is fantastic with the rest of your slightly more masculine decor. definitely the pink flamingos for a pop of color! love the flamingos. Colour and unexpected!-fun!! I love your pieces but if you're going to change them then I vote for the flamingos, definitely! The flamingos for sure! I have them in my own living room (near my gray sofa!) and love them. Got to love those crazy pink birds! Those are really cool choices. I am into the Zebra and the Flamingo. I really love the two pieces you already have up there, but out of the animals my favorites are the flamingos! The pink adds a nice pop of color! Pink makes people happy! Flamingos! two pink flamingos!!!! SO cute and girly! The flamingos! Love the pop of color! Number 3 all the way - ostrich and her egg! i love the way the flamingo looks with the pink, but I think the ostrich and her egg because it's so different! I have to agree with some people who said it before - I really really think the original art you have hanging there now look so great. But I am sure you will make a good choice of any of the animal prints as well. The flamingos would tie-in the pink in your office and your general sophisticated, girlie taste. I can't wait to see the big reveal! This is though. I really want to say the zebra/tiger combo because a) the patterns of their coats, especially the zebra, would compliment the rug so well and b) they're adorable! But it almost seems like it would be too matchy-matchy. So my vote goes to the flamingos: the black in their beak still ties in with tie rug but the pink really energizes the room (not that it's dull!) and adds a really unexpected touch. the pink flamingos to tie the room a bit into your office. Definitely the two flamingoes! I just bought a few of the babies for my daughter's playroom... they totally make the space! Also- where did you get that awesome black dotty pillow on the sofa?! Ost and her egg. So unexpected and unpredictable. the pink flamingos for a pop of color! Love the flamingo pair! Love the touch of pink they add to the otherwise neutral room. Although for a bit of humor, the ostrich and egg are so fun. I don't think you can go wrong with any of these choices. Flamingos! I love the pop of pink and they're so fun! i really like the flamingos! Ostrich and egg! A little humour is so important in life!